1022 Each man receives his eternal retribution in his immortal soul at the very moment of his death, in a particular judgment that refers his life to Christ: either entrance into the blessedness of heaven-through a purification or immediately, -- or immediate and everlasting damnation. The Global War on Christians by John L. Allen, Jr. The Illinois Lottery is huge and over 600 million people have bought tickets. For those who are interested, there IS a patron saint of lotteries, lottery tickets and lottery winners. 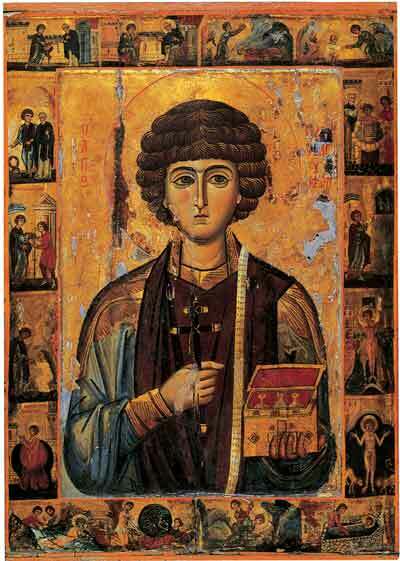 St. Pantaleon. According to Wiki, from where I got the icon picture and this information through the mediation of an American seminarian....Pantaleon was converted finally after messing about in medicine. He studied medicine with such success, that the Emperor Maximian appointed him his physician. One day as our saint was discoursing with a holy priest named Hermolaus, the latter, after praising the study of medicine, concluded thus: "But, my friend, of what use are all thy acquirements in this art, since thou art ignorant of the science of salvation? OK, it you buy a ticket, pray to this saint and win something, you can help out me, STM. I only want a few things-but, despite the fact there is a patron saint, I do not advise gambling...God bless all. One resident told RT the Islamist rebels massacred residents when they entered Adra Wednesday. "The situation was terrible -- with killing, atrocities, and fear as the background. Unidentified armed men came into town, but it was obvious that they were Jabhat al-Nusra militants," Muhammad Al-Said told the Russian news channel. "The worst crime they committed was that they toasted people in ovens used to bake bread when those people came to buy it. They kidnapped and beat up many." The United Nations has estimated more than 100,000 people have died and hundreds of thousands of people have been injured since the Syrian civil war began as peaceful anti-government protests in March 2011. NAPCIS exists to support schools that have chosen to operate as private entities: with autonomous educational philosophies, standards, pedagogical approaches, and curriculums. These schools exist as institutions faithful to the Catholic Church and faithful to passing on the Catholic faith to the children entrusted to them. NAPCIS recommends that Catholic faith-based schools not use the Common Core State Standards as the foundation for their educational efforts. As faith-based schools we have a different mission than public schools. Because a school’s mission drives its standards and these standards drive curriculum, we should not simply use the Common Core Standards as our base and then make some adaptations. The Common Core State Standards are explicitly and only “college and career” focused. In stark contrast, our schools are focused on comprehensive human formation and assisting our students to encounter Christ and to pursue truth, beauty and goodness in all subject areas. In the context of this larger mission our students are also better prepared for college and life beyond. NAPCIS believes that our schools must set their own standards animated by their own unique mission. Complementing this mission, our standards will determine the appropriate instructional strategies, curriculum, and assessment for our students, as well as how our schools are evaluated. With this said, we acknowledge that there is a substantial amount of acceptable secular material in the Common Core State Standards that Catholic faith-based schools can reference as part of their much broader educational efforts. Careful use of these acceptable parts of the Standards for reference, rather than whole scale replacement of our own standards, is a prudent response to the reality of the Common Core State Standards. However, we recommend caution in interfacing with parts of the Common Core State Standards, as the animating philosophies and pedagogies behind them have not yet been fully vetted by research and may not be appropriate for all subjects and all grades. At this early, untested and controversial point in American public schools’ first attempts at nationalized standards, we believe Catholic faith-based schools should use their own standards to ensure proven academic excellence and fidelity to mission. As you all know, I love being in Malta. However, I am not a photographer. Here is a nice set of many photos for those who are interested. Thanks to Mr. Scicluna for posting these. As I have noted in the long perfection series and on the Doctors of the Church series, there are many levels of prayer in the teaching of the Catholic Church. When I was in England, I discovered that some nuns were using the word "contemplation" incorrectly. I have so many posts on prayer and the necessary understandings of the level, that I encourage readers to follow the labels at the side, or tags. I shall put some links at the bottom, but this post is a warning. Please take these notes seriously, as so many people fall into false teaching about contemplation and end up out of the Church. Read, again, this Vatican document on the evils of New Age practices. 1) One must stay within the orthodoxy of the Church in order to attain holiness. If one is not orthodox, and especially, if one is hetrodox, one has opened one's self up for deception in prayer. The Church and Her Teaching protect us. 2) False, man-made religions cannot teach us anything good about contemplation, but the saints do-see all my posts on John of the Cross, Teresa of Avila and Catherine of Siena, for example. 3) One must be purified in the senses and in the spirit before reaching the state of contemplation. Contemplation, again, is not mediation on the Scriptures or the Life of Christ. See other posts for definitions. But, if one is not purfied and thinking that "emptiness" is the goal of contemplation, that person may very well be opening the soul and mind to demonic activity. Purification first, contemplation after, in the Illuminative State. 4) Christ is the center and reason for prayer, not us, not our well-being, nor even a sense of peace. Christ is the center of all our activities, including prayer. I shall write more about this later in the week. Here are a few older links. The first one deals with an aspect of sin and responsibility. I suggest following the Dark Night posts as well. Because of Michael Voris's excellent video on the 16th, because my background is Czech and my great-granfather, a Knight of St. Gregory and a signer of the Czech Constitution, friend of Benes and Masaryk, and master of many other things, died heartbroken at the invasion of his country, because my ancestry is Jewish and because Kenneth Branagh is such a good actor, I just watched Conspiracy, which is available at the bottom of this post. I grew up knowing about Lidice and Kristallnacht. These were my people-many of my ancestors disappeared in the war. People planned these horrific events, and the Holocaust. If you have not read my little novelette of the past weekend, do so. I highly suggest you look at Michael's video from the 16th and then take time to watch the movie. This will all happen again, but with Catholics. Here are some related posts of mine. That one has more links on it as well. Are there people in hell? Historians regard Heydrich as the most fearsome member of the Nazi elite. Hitler called him "the man with the iron heart". He was one of the main architects of theHolocaust during the early war years, answering only to, and taking orders from, Hitler, Göring, and Himmler in all matters pertaining to the deportation, imprisonment, and extermination of Jews. Heydrich was one of the organisers of Kristallnacht, a pogrom against Jews throughout Germany on the night of 9–10 November 1938. Heydrich sent a telegram that night to various SD and Gestapo offices, helping to coordinate the program with the SS, SD, Gestapo, uniformed police (Orpo), SA, Nazi party officials, and even the fire departments. It talks about permitting arson and destroying Jewish businesses and synagogues, and orders the confiscation of all "archival material" out of Jewish community centres and synagogues. The telegram ordered that "as many Jews – particularly affluent Jews – are to be arrested in all districts as can be accommodated in existing detention facilities ... Immediately after the arrests have been carried out, the appropriate concentration camps should be contacted to place the Jews into camps as quickly as possible." Twenty-thousand Jews were sent to concentration camps in the days immediately following; historians consider Kristallnacht the beginning of the Holocaust. On Himmler's instructions, Heydrich formed the Einsatzgruppen (task forces) to travel in the wake of the German armies at the start of World War II. On 21 September 1939, Heydrich sent out a teleprinter message on the "Jewish question in the occupied territory" to the chiefs of all Einsatzgruppen with instructions to round up Jewish people for placement into ghettos, called for the formation of Judenräte (Jewish councils), ordered a census, contained Aryanization plans for Jewish-owned businesses and farms, among other measures. [b] The Einsatzgruppen followed the army into Poland to implement the plans. Later, in the Soviet Union, they were charged with rounding up and killing Jews via firing squad and gas vans. By the end of the war, the Einsatzgruppen had murdered over one million people, including over 700,000 in Russia alone. On 10 October 1941, Heydrich was the senior officer at a meeting in Prague that discussed deporting 50,000 Jews from the Protectorate of Bohemia and Moravia to ghettos in Minsk and Riga. The officers also discussed taking 5,000 Jews from Prague "in the next few weeks" and handing them over to the Einsatzgruppen commanders Arthur Nebe and Otto Rasch. Establishing ghettos in the Protectorate was also planned, resulting in the construction of Theresienstadt, where 33,000 people would eventually die. Tens of thousands more passed through the camp on their way to their deaths in the East. In 1941 Himmler named Heydrich as "responsible for implementing" the forced movement of 60,000 Jews from Germany and Czechoslovakia to the Lodz (Litzmannstadt) Ghetto in Poland.On 29 November 1939, Heydrich issued a cable about the "Evacuation of New Eastern Provinces", detailing the deportation of people by railway to concentration camps, and giving guidance surrounding the December 1939 census, which would be the basis on which those deportations were performed. In May 1941 Heydrich drew up regulations with Quartermaster general Eduard Wagner for the upcominginvasion of the Soviet Union, which ensured that the Einsatzgruppen and army would cooperate in murdering Soviet Jews. Under suitable direction, the Jews should be brought to the East in the course of the Final Solution, for use as labour. In large labour gangs, with the sexes separated, the Jews capable of work will be transported to those areas and set to road-building, in the course of which, without doubt, a large part of them ("ein Großteil") will fall away through natural losses. The surviving remnant, surely those with the greatest powers of resistance, will be given special treatment, since, if freed, they would constitute the germinal cell for the re-creation of Jewry.